The Education Ministry on Saturday apologised for a system error that affected the mathematics results of hundreds of students who sat for the national exam last month. Last week, hundreds of complaints were filed by high school students who were dissatisfied with their mathematics results. The sheer amount of complaints filed prompted the ministry to create a committee to review the results. The ministry said last week on Facebook that the error affected only the mathematics section of the national exam. After the review, the ministry boosted the amount of passing students from 75,059 to 76,034. Ministry spokesman Dy Kamboly said yesterday that following the release of the updated national exam results, students have 30 days to file additional complaints. Due to the error, the ministry has also postponed its announcement on the selection of students who will receive scholarships. On Saturday, the ministry issued a statement announcing the delay of the selection of students for scholarships. “The announcement has been pushed back from September 17 to September 18,” the ministry said. 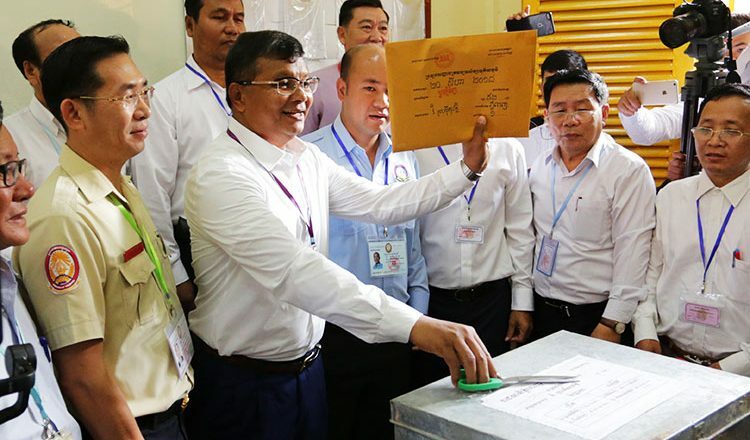 The Cambodian Independent Teachers Association on Thursday requested the ministry delay the scholarship announcement until the committee has examined all complaints. “CITA has requested the ministry to suspend all entrance exams while we wait for solutions to the students’ complaints,” CITA said. The ministry said last week that the number of Grade-A students increased by more than 100 after the review. “There are now 408 A-students, 2,222 B-students, 6,041 C-students, 15,180 D-students and 52,183 E-students,” the ministry said. Initial results showed that 75,059 students passed the exam, with 290 earning an A, while 1,532 students scored a B and 4,631 students scored a C.